We are sent to school to learn about a lot of stuff, educational or not. We are taught by our teachers through the lessons and activities that they give. They are able to evaluate how we are doing through assessment examples. They also know that we are learning and they know our learning styles through Student Assessments. Assessments can be done on a daily, weekly, and monthly basis. 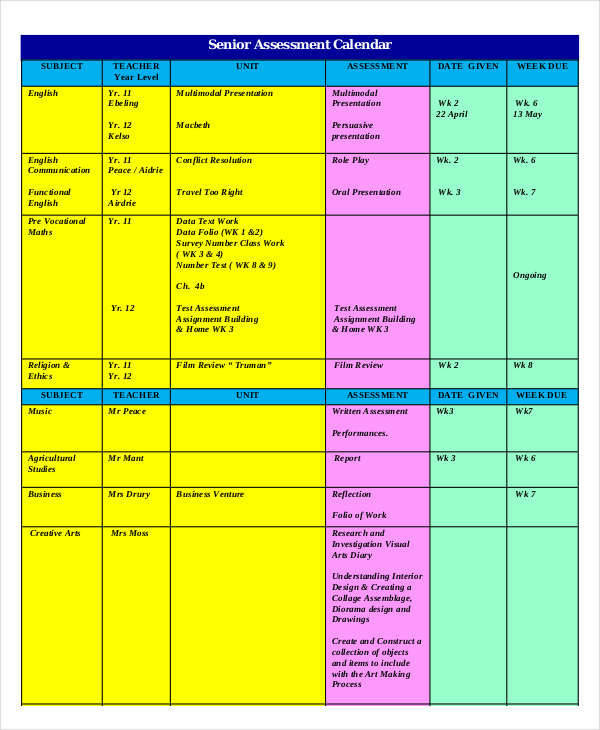 There are some who make Assessment calendar templates. The frequency depends on the need and purpose to make assessments. Whatever your need is, these 7+ free assessment calendar templates are sure to help you with it. 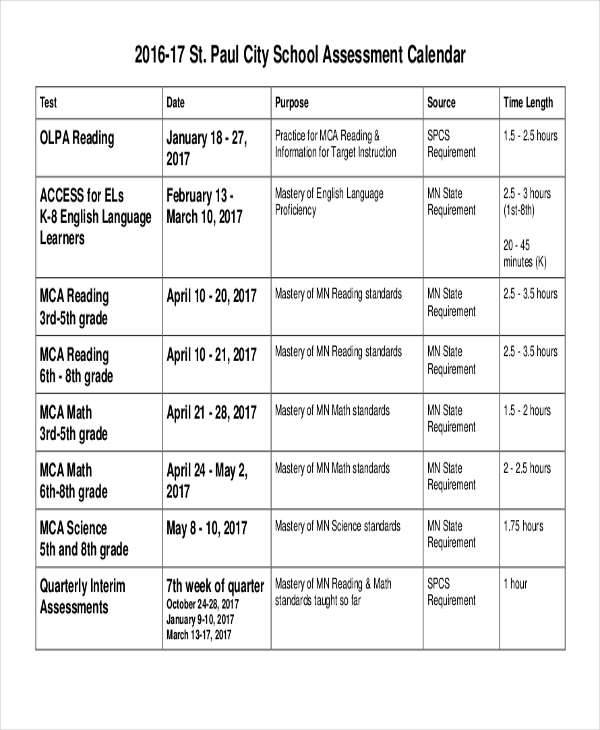 What Is an Assessment Calendar? An assessment calendar sample is a calendar used to plan or schedule assessment activities to evaluate the performance of a certain company or output of a specific product or program. It helps organize assessment schedules and determine what to do and where to go next in the evaluation process. With the use of this calendar, employees or individuals will have an idea of what is to happen. That way they can make appropriate preparations. You can also check out our school calendar templates. If it is your first time to create an assessment calendar then you will surely find it difficult to start. But don’t fret because we are going to help you with these simple steps. Determine the type of sample assessment you are going to do or the purpose of your assessment. List down the things that you have scheduled and those that need to be included in your plan. 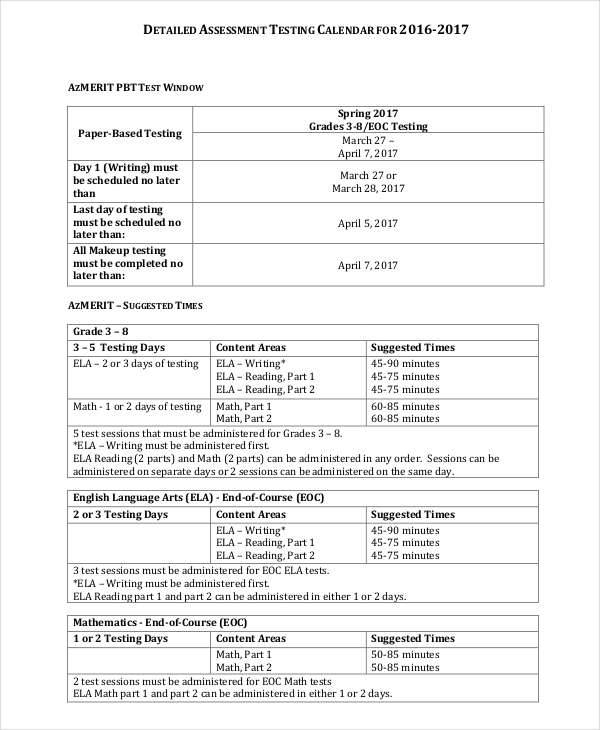 Making this list will make it easier and faster to make an assessment calendar. Choose a calendar template that is appropriate for the type of assessment that you are going to do. You can download from our free templates or draw one on your own. Lastly, transfer your list to your calendar template and you should be good. 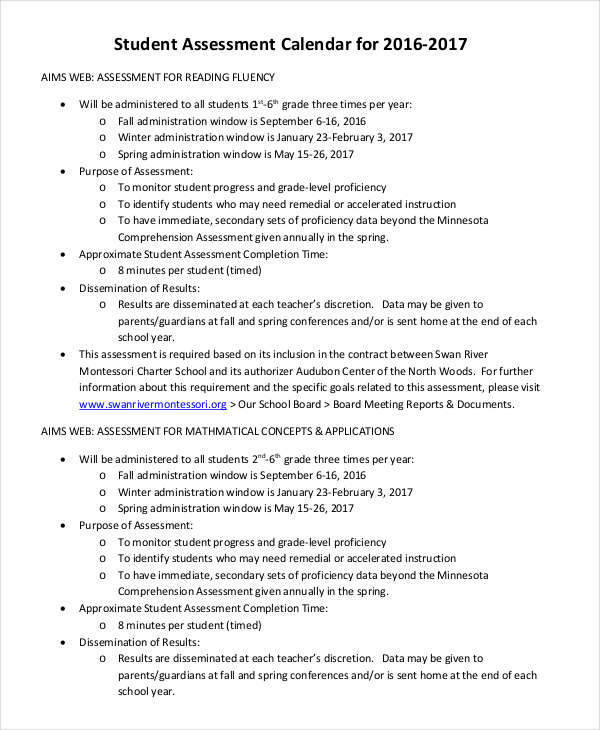 What is the Purpose of an Assessment Calendar? 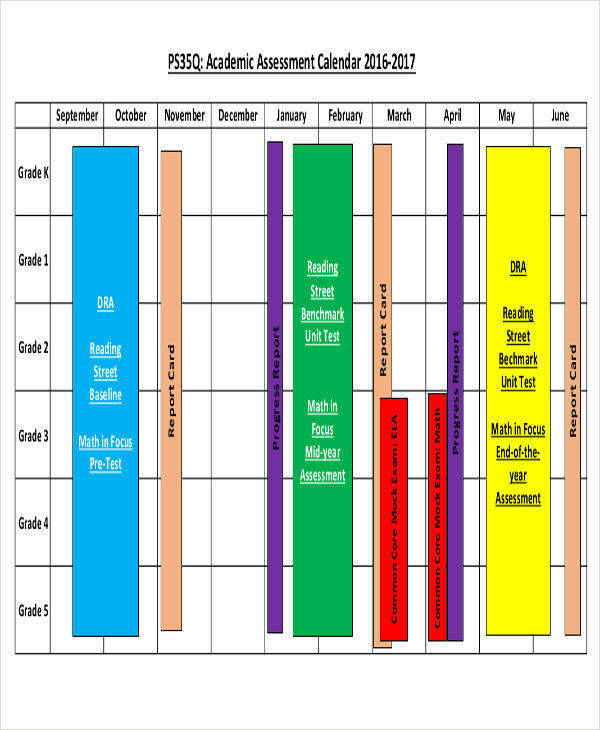 In schools, assessment calendars are used to schedule school templates, whether it is a local or national assessment. Some school assessments are done monthly or annually depending on the set standards of the responsible agency. In business, it is used to take note or keep track of important assessment reports for sales and market trends. It also serves as a reminder for when an individual, employee, department, or unit will be assessed. 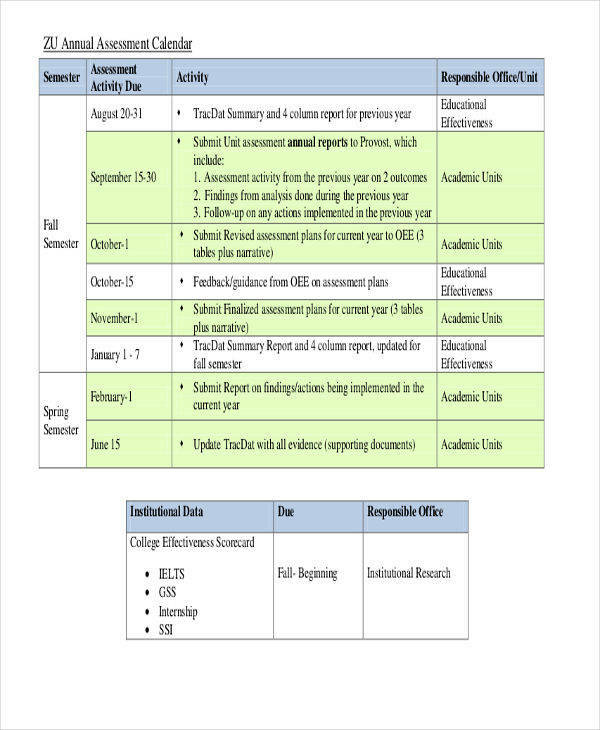 Using an assessment calendar will help you keep track of your priorities. You will be able to determine what to do first and what to do last. It helps in organizing a lot of stuff that is related to any kinds of assessment. 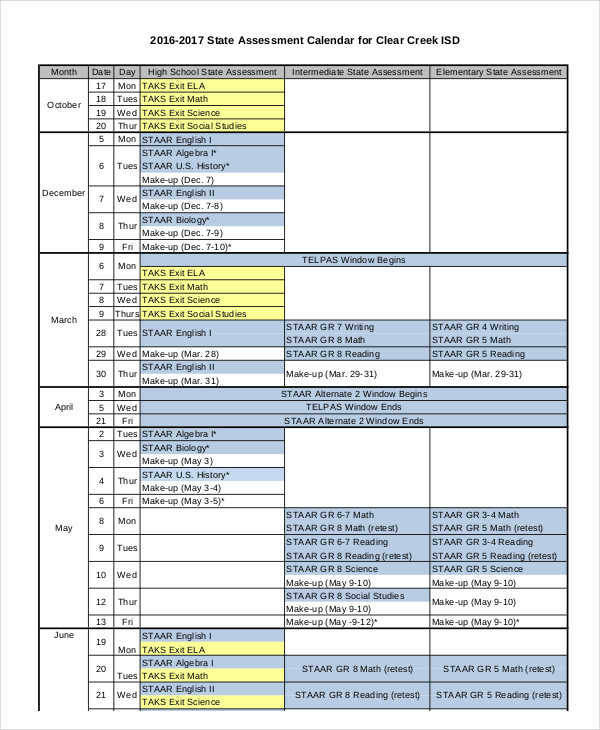 In medicine, assessment calendars are also used to set certain schedules to evaluate equipment, practices, processes, and performance of the facility. 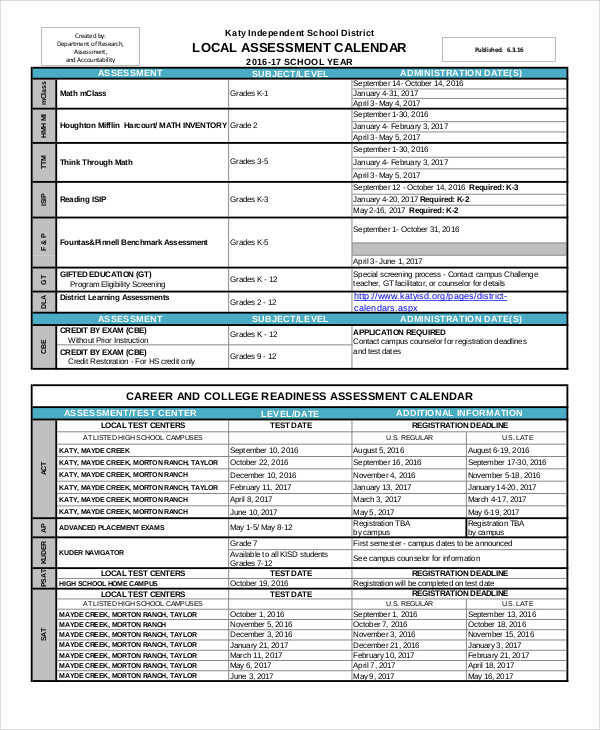 An assessment calendar lets you visualize all of your schedules in a glance. Calendars are now made handy and portable.We also have wall calendar template and weekly calendar template available online.